Now, in its twelfth year, Designblok has been showcasing some of the hottest designers working in Prague. This year’s exhibition will run from the 5th – 10th of October and present a range of jewelry, fashion, furniture, porcelain and glassware. Last year’s theme, SPRING, explored the themes of rebirth and awakening. This year Designblok continues with the natural theme. Instead of a season, it will be the element WATER. The choice of theme was inspired by the location of the three exhibition sites: Old Town, Karlín and Holešévice, through which the Vltava flows and connects the quarters geographically as well as symbolically. As Zielinski said of this year’s theme, “Water is associated with memory, unconsciousness and many other topics. We think it’s a good topic for this year. In the end we will have a few ecological topics connected with water this year which we prepare with the United Nations, and so in the end it is quite a complex topic.” If last year’s winners and entries are anything to judge by, the designs in this year’s exhibition will continue to explore the line between creativity and functionality. This monumental 7000 m2 piece of twenties functionalism might seem an unlikely place for one of the hippest shows in town. With its uniformly tiled exterior, the place appears – at first glance – to exude sterility. Stepping inside reveals a totally different place – vast, spacious and above all light. As my guide on the day said, the building has a special spirit. Moreover, it something of a blank canvas, a huge tabula rasa for the designers to show their vision to the world. before it was transformed by Designblok. If you want to see an after, head on down to the exhibit. Dana Bezděková ‘s chess inspired collection, ŠACH, will be launched. On Tuesday 5th October is a fashion show starting at 7pm. On Friday there is an opportunity to meet the designer and play chess from 10:00am until 9:00pm. Both events are on the 3rd floor. Trash Made present recycled jewelry on the 4th floor. On Saturday they will host a cocktail party from 2pm to 6pm. For those looking to furnish their flat or home, local axrchitect and designer Rudolf Netík will have his modular book cases on display. 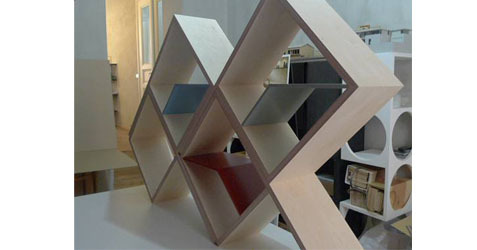 The components stack together to form a lattice for your beloved books. If you want to dazzle people, the lights from Lasvit might be what you’re looking for. Lights from the exclusive collection include Inside by Kateřina Doušová and La Perla by Suprodesign. Visit the link above for images. For those looking for something for that special cat in their lives might consider the range of designer furniture for cats by Catworks. Each piece is designed as a letter of the alphabet. Purveyors of the Czech Republic’s stylist sneakers, Botas 66 will present their new models on Tuesday 6pm on the 2nd floor. Apart from the many items on display, Designblok are running a number of events. Everyday a fashion show will take place in the vast foyer. Radio 1 will celebrate twenty years every afternoon on the 3rd floor. Lovers of the book (or film) Rozmarné Léto (Capricious Summer) by Vladislav Vančura may want to check out Polstrin Design‘s literary party with lemonade, everyday of the festival from 5pm to 6pm. For those of a more ecological bent, Hnutí DUHA will host two debates, one on Thursday 7th, the other on Friday 8th, both starting from 5pm to 6pm. Thursday’s discussion is with architect Aleš Brotánk on passive houses. Friday’s is with Václav Cílek and concerns global warming. If this all seems too passive and you want to try your hand at creation, Malina Design has an all day ‘Make Your Own Lamp’ workshop on Saturday 9th. As Designblok comes to a close there will be a couple of musical events. On Thursday 7th from 6pm ambient electronic duo The Ecstacy of St. Theresa will perform as part of a collaboration with Denisa Nová , Phase and VICE on the 4th floor. The whole six days will culminate in sound and style at the Design Lovers’ Party. It starts at 7pm with the Designblok Editors’ Awards, when the winners of the 12 categories will be announced. This will be followed by the launch of Toxique‘s new album with clothes by MojeMoje. Toxique offer up a playful type of funk. MojeMoje are probably best known for their animal sound designs. It should be quite an irreverent night. On the last day, Sunday 10th from 2pm, there will be an auction of the best Czech and international 20th century design. The event is suitably called THE BEST IS ON THE TOP (TO NEJLEPŠÍ JE NAHOŘE). Of course, this is only a sample of what promises to be a huge six days. There is much more in store, sometimes literally, around the city, such as Gallery Křehký or Qubus. Over the six days prepare to explore Prague’s creative side. Exit Vltavská Metro Station. Cross tram lines (carefully). Go up the nasty old stairs. It’s the big white building. As ever, you’ve visited the exhibition let us know what you think on our Facebook page. COMPETITION: Send us an email to comps@expats.cz saying what’s this year’s Designblok theme and enter the competition to win 2×2 tickets to the Exhibition + program + Designguide magazine.Correct answers go to a hat and winners will be drawn on Wednesday 29th September. And the winners are..Kamilla Akhmadullina and Julia Morrison. Congrats!